Self-esteem is the way you think of and judge yourself. When you have healthy self-esteem you believe you are as important as other people and deserve to be treated with respect. It sounds pretty easy but sometimes it isn't. When we compare ourselves to others and measure ourselves against unattainable standards we can feel our self-esteem plummetting. The other day I overheard a young woman telling her friend she didn't feel she was good enough at anything she did. She then spoke about her doubts about doing well enough in her studies, even though she was getting very good marks. She was worried she would lose her boyfriend because she thought he would find someone better and dump her. Her self-esteem needed a boost. Low self-esteem can come from criticism and rejection by others and/or our own unhelpful thoughts. If an individual is always comparing themselves to others and finding themselves lacking, this may lead to low self-esteem. Often we are our own worst critics. Rather than aiming at 'perfection' and constantly feeling the need for self improvement, accept yourself as you are. Okay, it doesn't hurt to attend a self improvement class to help you become more assertive or to handle conflict more effectively. But constantly looking for things to improve because you feel you are not good enough, not worthy of love, is not constructive. 1. Think of your successes rather than your failures. Have you ever been really annoyed at yourself for forgetting one thing when you did remember nine items? You could turn this situation around and give yourself credit for everything you did remember. Make it a habit to give yourself credit for all you get done rather than stressing about what you don't. Were all of the tasks your responsibility anyway? 2.Talk to yourself positively in the way you would to a good friend who was feeling overwhelmed. Would you call a friend 'stupid' for making a mistake? More likely you would be supportive and encourage them to keep going. You might suggest they will feel better after a good night's sleep. Perhaps that's what you need. 3. Be aware of the things that make you an individual. Some of your characteristics are neither good nor bad, they are just 'you'. You will handle situations in a way that works for you. Other people may handle things differently but that doesn't mean you are wrong. Depending on the situation, it doesn't mean others are necessarily wrong either, they just do it differently. 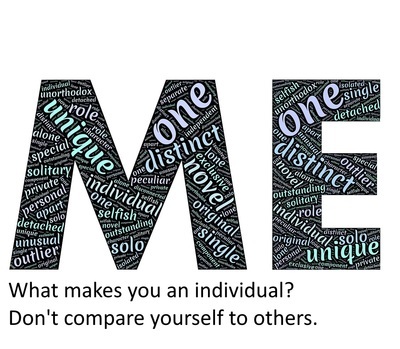 Don't compare yourself to others all the time. You don't know the whole story of another person's life. Their challenges and support will be different. You aren't witness to all the behind the scene events. 4. Concentrate on today rather than worrying about the past or stressing about the future. Confession time, on occasions I have to stop myself from worrying if I handled things correctly in the past. 'The Past' is sometimes decades ago. It doesn't matter now. If I didn't tell myself, 'Stop,' I would sometimes stress about the distant past. 5. Make time to have some fun each day. Some people feel guilty about just taking time out to kick back and have fun. However, it's so good for your mental health to relax or have a good belly laugh or to do both at the same time. 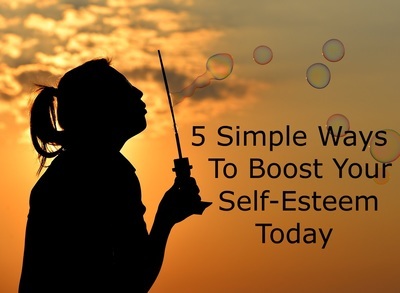 These ways of boosting your self-esteem do not require money or attending a special class. They do not involve special skills. So you can start today, this very minute.